Story I wrote for my schools news paper. Students enrolled in California community colleges and universities under Assembly Bill 540 may become eligible for financial aid under Assembly Bill 2083. The bill, which was introduced by assembly speaker Fabien Nunez, was approved April 2 and sent to appropriation on April 9 and was then placed in the suspense file. Appropriation refers to the discussion of a bill in terms of designating money and determining the affects and changes it would have on the state budget. When the bill is put in suspense, it means that further discussion is needed to determine its cost when $150,000 is exceeded. Under the bill, students would be able to apply for grants, scholarships, loans and work-study programs, which are unavailable to AB 540 students. The bill was approved by the Assembly Committee for Higher Education and would amend the Donahoe Higher Education Act, which sets educational guidelines that colleges and universities abide by. The bill would require that the Trustees of the California State University, Board of Governors of the California Community Colleges and the Regents of the University of California create forms and procedures for AB 540 students to apply and receive financial aid from the school they’re attending and would include the Board of Governors fee waiver. Sonia Campos, assistant to assembly speaker Nunez, said that funding for financial aid in colleges and universities is determined by the number of students graduating from high schools and enrolled in colleges and universities. 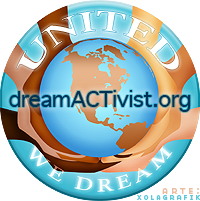 The number of students, which includes undocumented students, will determine the amount of financial aid that will be awarded to students who qualify. Campos also said that not every student that is accounted for would qualify for financial aid, whether they’re AB 540, miss the deadline or incorrectly fill out the application. Money set aside for these counted individuals is left unused even though the money was set aside for non-eligible students. “With AB 2083, Nunez wants to change the current policies so AB 540 students can have access to money that was set aside for them,” said Campos. Selene Salas, an AB 540 student, said the bill would dramatically improve her personal and scholastic life, “because at least I wouldn’t be working two jobs in order to pay for school. Salas is currently attending Cal State Northridge as a double major in Liberal Studies and Chicano/a studies. If AB 2083 were to pass, she said she would definitely continue her education and pursue her masters in the fall at Cal State Los Angeles. “Seats at state universities are valuable finite resources, and for every (illegal immigrant) kid who gets in, that’s one fewer legal immigrant or American who does not get in,” said Ira Mehlman, spokesman for the Federation for American Immigration Reform in an interview for the Los Angeles Times. Under Assembly Bill 540, undocumented students enrolled in an institution of higher learning can pay resident fees as opposed to out-of-state fees if they attended a California high school for three years and graduated. Upon enrollment, students sign an affidavit, which allows them to attend any community college and state university in California. The affidavit states that the student is in the process or will apply for legal residency as soon as they are eligible to do it. In my random endeavors reading through magazines, blogs, news papers and what have you I run into interesting things every now then. 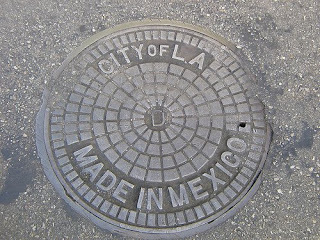 In "Tu Cuidad" Magazine, they published a photo of a man hole that read "City of L.A. Made in Mexico." The photo taken by Mike and it was in the magazine with an essay by Daniel Hernandez titled "Meditation on man hole cover. Needless to say that ever since that faithful day that I read the piece, I have been on a quest to find said man hole cover and have a picture of my own. On my way to the LAvsWAR show this past Friday, April 10, I ran across something just as good as the made in Mexico cover. My quest still still goes on but I'm satisfied for the moment.